This article is about the Dutch province. For other uses, see Brabant. North Brabant (Dutch: Noord-Brabant; [ˌnoːrd ˈbraːbɑnt] ( listen)), also unofficially called Brabant, is a province in the south of the Netherlands. It borders the provinces of South Holland and Gelderland to the north, Limburg to the east, Zeeland to the west, and Belgium to the south. The northern border follows the Meuse westward to its mouth in the Hollands Diep strait, part of the Rhine–Meuse–Scheldt delta. The Duchy of Brabant was a state of the Holy Roman Empire established in 1183 or 1190. It developed from the Landgraviate of Brabant and formed the heart of the historic Low Countries, part of the Burgundian Netherlands from 1430 and of the Habsburg Netherlands from 1482, until it was split up after the Dutch revolt. After the War of Independence, Catholics in the Southern Netherlands were systematically and officially discriminated against by the Northern Protestant government until the second half of the 20th century, which had a major influence on the economic and cultural development of the southern part of the Netherlands. Present-day North Brabant (Staats-Brabant) was adjudicated to the Generality Lands of the Dutch Republic according to the 1648 Peace of Westphalia, while the reduced duchy remained in existence with the Southern Netherlands until it was conquered by French Revolutionary forces in 1794. Until the 17th century, the area that now makes up the province of North Brabant was mostly part of the Duchy of Brabant, of which the southern part is now in Belgium. During the 14th and 15th centuries, the area experienced a golden age—especially the nowadays-Belgian cities of Brussels, Mechelen, Leuven and Antwerp, and nowadays-Dutch cities of Breda, Bergen op Zoom and 's-Hertogenbosch. After the Union of Utrecht was signed in 1579, Brabant became a battlefield between the Protestant Dutch Republic and Catholic Spain, which occupied the southern Netherlands. As a result of the Peace of Westphalia, the northern part of Brabant became part of the Netherlands as the territory of Staats-Brabant (State Brabant) under federal rule, in contrast to the founding provinces of the Dutch Republic which were self-governing. Attempts to introduce Protestantism into the region were largely unsuccessful; North Brabant remained strongly Roman Catholic. For over a century, North Brabant served mainly as a military buffer zone. In 1796, when confederate Dutch Republic became the unitary Batavian Republic, Staats-Brabant became a province as Bataafs Brabant. This status ended with the reorganisation by the French, and the area was divided over several departments. 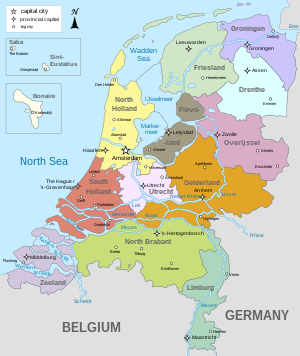 In 1815, Belgium and the Netherlands were united in the United Kingdom of the Netherlands, and the province of North Brabant was established and so named to distinguish it from South Brabant in present-day Belgium, which seceded from the Kingdom in 1830. This boundary between the Netherlands and Belgium is special in that it does not form a contiguous line, but leaves a handful of tiny enclaves (and enclaves inside enclaves) on both sides of the border. A few of these irregularities were corrected (Luyksgestel was exchanged for Lommel), Huijbergen became totally Dutch, but some remain, notably Baarle-Hertog (Belgian) and Baarle-Nassau (Dutch). When the present province was instituted, its territory was expanded with a part of the province of Holland and the former territory of Ravenstein which had previously belonged to the Duchy of Cleves, as well as several small, formerly autonomous entities. The period from 1900 until the late 1960s is called Het Rijke Roomse Leven (translated as 'the rich Roman life', with 'Roman' meaning 'Roman Catholic'), an era of strong religious belief. Het Rijke Roomse Leven came about as result of the emancipatory drive of the province's disadvantaged Catholic population and was supported by a Roman Catholic pillar, which was directed by the clergy, and not only encompassed churches, but also Roman Catholic schools and hospitals, which were run by nuns and friars. In those days every village in North Brabant had a convent from which the nuns operated. Politically, the province was dominated by Catholic parties: the Roman Catholic State Party and its post-war successor, the Catholic People's Party, which often held around 75% of the vote. In the 1960s secularisation and the actual emancipation of the Catholic population brought about the gradual dissolution of the Catholic pillar, as church attendance decreased in North Brabant as elsewhere in Western Europe. The influence of Het Rijke Roomse Leven (The Rich Roman (Catholic) Life) remains in the form of education where some schools are still Roman Catholic, (today run by professional teachers and not by nuns) and in North Brabant's culture, politics, mentality and customs, such as carnival. Though the interpretation of the Roman Catholic identity in North Brabant has shifted during the last 65 years from religious to cultural, the province still has a distinct Catholic atmosphere when compared to the provinces north of the major rivers. A cultural divide is still found between the "Catholic" south and the "Protestant" north, but with a total of 1.5 million people and 20% of the industrial production in the Netherlands the southern "Catholic" area BrabantStad has become one of the major economical important, metropolitan regions of the Netherlands. As of 2010, Catholics were no longer a majority of the population in the province of North Brabant. Only 1–2% of the total population of the Catholic area attend mass, and these churchgoers consist mostly of people over 65 years old. With a population density of 501/km², North-Brabant is above average urbanized. The urbanization is at the center of the province at largest, where the 'kite' (the Brabantse Stedenrij Breda, Tilburg, Eindhoven and 's-Hertogenbosch) is located, the rest of the province has a more rural character. The province has preserved some of its scenic nature well. National parks are found at the Loonse and Drunen Dunes, De Biesbosch and De De Groote Peel, on the marshes of the Meierij at Oisterwijk and Boxtel (within an area called Het Groene Woud), the border park Zoom-Kalmthoutse Heide, and in the forested area around Breda. Also, south of Eindhoven named De Kempen is an area with farmlands and forests. In Heeze, also south of Eindhoven, are the heath areas the Groote Heide (333 ha) and Strabrechtse Heath (1500 ha) located. The Strabrechtse Heide holds also the largest fen of the Netherlands. The Beuven (Beu fen) measures 85 hectares. Like most of the Netherlands, North Brabant is mostly flat but nearly every part of North Brabant is above sea level; therefore, there are not as many canals as in the lower parts of The Netherlands. Although most of the population lives in urban areas, the province is scattered with villages around which most of the land is cultivated. The Biesbosch (from bies, "rushes", and bosch, "woodland") is an area southwest of Dordrecht formed when the dike on the Meuse burst and the St. Elizabeth's floods on November 19, 1421 engulfed great tracts of land in the southwestern Netherlands and altered the geography of the whole area, inundating over 40,000 hectares/100,000 acres of land. More than four-fifths of the flooded land has been reclaimed since the 18th century. An area of 6,000 hectares/15,000 acres was left as it was, and now forms the Biesbosch nature reserve and bird sanctuary. Until the end of the 1960s the Biesbosch was directly connected with the sea and subject to changing tide levels. As a result, it developed a flora which tolerated brackish water and was the home of numerous waterfowl. Since the damming of the Haringvliet there is no variation in water level, and both flora and fauna have adapted to the new environment. The Biesbosch is crisscrossed by a network of footpaths and bikepaths and by countless rivers and streams which offer excellent facilities for water sports (sailing, surfing). In spite of the large numbers of visitors the natural environment has remained largely unspoiled. The Biesbosch nature reserve can be reached by car only from the east (preferably via Werkendam). The southwest part of the area, with its three large reservoirs of drinking water, is closed to road traffic. The Biesbosch can also be reached by boat from Drimmelen, Geertruidenberg or Lage Zwaluwe. The historical region of Kempen occupies the southern part of the province of Noord-Brabant and extends south of Eindhoven far into northern Belgium. To the east it reaches as far as the Meuse valley. The surface topography of De Kempen is very uniform. Most of it lies between 5m/15 ft and 35m/115 ft above sea level. The basement rocks are Cretaceous and Tertiary sediments, which are overlaid by Ice Age gravels and sands carried here by rivers of melt-water from the retreating glaciers. It is a typical area of sandy heathland. The infertile soil is suitable only for undemanding crops such as rye, oats, potatoes and fodder plants; this limits the profitability of agriculture. Until a few decades ago Kempen was a region of heathland and sand drifts with a sparse growth of pines, a few scattered villages subsisting on the poor soil and some small towns; and this is still the pattern in much of the region. In recent years, however, the rapid advance of industry has brought about profound changes in this agricultural region. The origins of this industrial development go back 70–100 years. The main concentrations of industry are along the southern frontier of the Netherlands, e.g., at Eindhoven, Helmond, Tilburg, Breda, 's-Hertogenbosch. In the east of Noord-Brabant, near the Limburgish border, is the Peel area, an expanse of moorland extending from Eindhoven to Venlo, on the border with Limburg. Southeast of Asten is a nature reserve (1,300 hectares/3,250 acres; visitor center at Ospeldijk) which has escaped destruction by peat cutting. Mostly boggy, it will appeal to nature lovers with its interesting flora and fauna. Apart from this small area almost the whole of the Peel has been brought into cultivation. The province is bordered by the Meuse River in the north. Its delta flows through De Biesbosch area, a national park. On 1 January 2015 the municipality of Maasdonk was merged into the existing municipalities of 's-Hertogenbosch and Oss. On 1 January 2017 Veghel, Schijndel and Sint-Oedenrode merged into a new municipality called Meierijstad creating the largest municipality of the province North-Brabant in terms of land area. Employment is found in the agricultural, industrial and service sectors, with agricultural and food processing companies such as Agrifirm, Bavaria, FrieslandCampina, Mars Incorporated, Nutreco, Royal Canin all having large production sites or their headquarters located in the province. The main agricultural products are corn, wheat and sugar beet, while cows and pigs are held as livestock. Other important industries are automobile production (e.g. General Motors in Breda and Tesla in Tilburg), electronics, textile and shoes. In the 20th century, tourism has become an important sector for North Brabant. Another tourist attraction is theme park Efteling in Kaatsheuvel, the largest of the Benelux. BrabantStad is a partnership between the municipalities of Breda, Eindhoven, Helmond, 's-Hertogenbosch and Tilburg and the province of North Brabant. According to national rules, BrabantStad is defined as the area of Eindhoven, Den Bosch and Tilburg. Brabantian is not a minority language in the Netherlands. It can be divided in two main dialects: East Brabantian and West Brabantian [nl]. Along with the Hollandic dialects it is one of the two most spoken versions of Dutch. Brabantian has, as compared to the other main Dutch dialects, had a big influence on the development of Standard Dutch. This is because Brabant was the dominant region in the Netherlands when the standardization of Dutch started in the 16th century. The first major formation of standard Dutch also took place in Antwerp, where a Brabantian dialect is spoken. The default language having been developed around this time, it therefore had mainly Brabantian influences. The early modern Dutch written language was initially influenced primarily by Brabantian, with strong influence from Hollandic emerging after the 16th century. Since the Brabantian dialect has developed faster than 16th- and 17th-century Dutch, it has become more diverse than modern Standard Dutch but is still quite similar and very understandable. About one third of the Dutch-speaking population lives in the Brabantian dialect zone. Both in large Brabantian towns such as Breda and Eindhoven and in rural areas many people still speak the original dialect or colloquial Dutch with a typical "southern" tongue. Tilburg and 's-Hertogenbosch have a large number of people speaking the Brabantian dialect. There are many museums, especially in the larger towns which include the North Brabant Museum in 's-Hertogenbosch, the Van Abbemuseum in Eindhoven, the Museum of the Image in Breda, Noordbrabants Natuurmuseum in Tilburg. Also a few towns have a large theater like the Chassé Theater in Breda and the Eindhoven Park Theatre. Large, reputable music venues like the 013 in Tilburg, which boasts the largest space of music venues in the Netherlands, and the Effenaar in Eindhoven offer concerts by major artists. Smaller venues like Mezz Breda, W2 Concert in 's-Hertogenbosch and the smaller halls of the 013 and the Effenaar offer concerts by emerging artists and bigger names in an intimate setting. The Designhuis, a public podium and interaction area for modern design and innovation in the former district court house. The Eindhoven Museum, an archaeological open-air museum which focuses on the region's Iron Age and Middle Ages. It merged in 2011 with Museum Kempenland which was a regional museum, which documents the history of the Kempenland region in objects, documents, paint and educational activities. Museum Kempenland's old location, the Steentjeskerk, is closed. Inkijkmuseum ("Look-In museum"; housed in an old linen factory in the Dommelstraat) is a small but special museum: it offers ever-changing exhibits, which are to be viewed through the building's windows. The Van Abbemuseum has a collection of modern and contemporary art, including works by Picasso, Kandinsky, Mondriaan, and Chagall. The Southern Dutch cuisine constitutes the cuisine of the Dutch provinces of North-Brabant and Limburg and the Flemish Region in Belgium. It is renowned for its many rich pastries, soups, stews, and vegetable dishes and is often called "Burgundian", which is a Dutch idiom invoking the rich Burgundian court which ruled the Low Countries in the Middle Ages and was renowned for its splendor and great feasts. It is the only Dutch culinary region which developed an haute cuisine, as it is influenced by both German cuisine and French cuisine, and it forms the base of most traditional Dutch restaurants including typical main courses such as Biefstuk, Varkenshaas, or Ossenhaas, which are premium cuts of meat, generally pork or beef, accompanied by various sauces and potatoes which have been double fried in the traditional Dutch (or Belgian) manner. Stews, such as hachee, a stew of onions, beef and a thick gravy, contain a lot of flavour and require hours to prepare. Vegetable soups are made from richly flavored stock or bouillon and typically contain small meatballs alongside a variety of different vegetables. Asparagus and witlo(o)f are highly prized and traditionally eaten with cheese and/or ham. Pastries are abundant, often with rich fillings of cream, custard or fruits. Cakes, such as the Moorkop and Bossche Bol from Brabant, are typical pastries. There are also savory pastries, especially the popular worstenbroodje (a roll with a sausage of ground beef). The traditional alcoholic beverage of the region is beer. There are many local brands, ranging from Trappist to Kriek. Beer, like wine in French cuisine, is also used in cooking, often in stews. North Brabant is home to 8 professional football clubs, more than any other province in the Netherlands. Three clubs (PSV, Willem II, NAC Breda) play in the Eredivisie, the highest professional football league in the Netherlands. Five clubs (Helmond Sport, FC Den Bosch, FC Eindhoven, TOP Oss and RKC Waalwijk) play in the Eerste Divisie, the second-highest division of professional football in the Netherlands. PSV Eindhoven is the biggest club of North Brabant, and most successful with 22 Eredivisie titles, 1 European Cup and 1 UEFA Cup, among many other domestic cups, and is one of the traditional "big three" clubs in the Netherlands. North Brabant is home to 3 hockey clubs that play in the Hoofdklasse. HC Den Bosch (Den Bosch), Oranje Zwart (Eindhoven) and MOP (Vught). Oranje Zwart is the most successful of these clubs with many prizes, in the regular competition as well as in Europe. The most recent prizes are National Champions in 2014-2015, 2015-2016 and European Champions in 2014-2015. The States of North Brabant (Staten van Noord-Brabant) have 55 seats and are headed by the King's Commissioner (Commissaris van de Koning), currently Wim van de Donk. Whereas the provincial council (the States-Provincial - Provinciale Staten) is elected by the inhabitants, the Commissioner is appointed by the King and the cabinet of the Netherlands. With 10 seats, People's Party for Freedom and Democracy is the largest party in the council, closely followed by Christian Democratic Appeal and Socialist Party, both with 9 seats. The daily affairs of the province are taken care of by the Provincial-Executive (Gedeputeerde Staten), which are also headed by the Commissioner; its members (commissioners - gedeputeerden) can be compared with ministers. Since October 1, 2009 Wim van de Donk (CDA) has been the King's Commissioner. The Provincial-Executive for 2015-2019 is based on a coalition of VVD, SP, D66 and PvdA. Province Secretary (provinciesecretaris): Annemie Burger. Traditionally the province of North Brabant was strongly Roman Catholic. Following the independence of the Netherlands, Catholics were vehemently discriminated against by the Protestant government until the mid-19th century. During the 1960s the relatively strong demarcation between the Catholic south on one side and the Calvinist west and north on the other side of the Netherlands started to diminish. In the second half of the 20th century a rapid secularization took place in North Brabant. In 2006 slightly more than half of the Brabantian people reported adhering to Catholicism. For example, in the Diocese of 's-Hertogenbosch, the eastern part of North Brabant and part of the province of Gelderland, 1,167,000 people reported an association with Roman Catholicism (56.8 percent of the population). However, only 45,645 residents of this area attended the mass on average, which is only 2 percent of the total population of the area. In western North Brabant (Diocese of Breda) is the number of people associating themselves with Catholicism also strongly decreased; only 52 percent of the West Brabantians identify as Roman Catholic. Church attendance was even lower in the west with only 1 percent of the West Brabantian population visiting churches. North Brabant is mostly Roman Catholic by tradition. Its people still use the term and certain traditions as a base for their cultural identity rather than as a religious identity, and the vast majority of the Catholic population is now largely irreligious in practice. Research among Catholics in the Netherlands in 2007 showed that only 27% of the Dutch Catholics could be regarded as theist, while 55% were ietsist or nontheist and 17% were agnostic. In 2010, about 6% of the population of North Brabant claimed adherence to Protestantism, while 4.5% of the population was Muslim; the latter mainly live in the larger and medium-sized municipalities. ^ "Cookiewall: Cookies op de Volkskrant - de Volkskrant". volkskrant.nl. Chisholm, Hugh, ed. (1911). "Brabant (duchy)" . Encyclopædia Britannica (11th ed.). Cambridge University Press. ^ "Kerkgebouwen en parochies". KASKI. ^ De gemiddelde bevolkingsdichtheid van Nederland bedraagt 403/km² (2012). ^ "10 Top-Rated Tourist Attractions in Eindhoven". planetware.com. ^ Maertens, Christophe (18 January 2019). "Burgemeesters van Ieper, Poperinge, Diksmuide en Veurne voorzichtig positief over 'Westhoek City'". Het Laatste Nieuws (in Dutch). ^ Windhorst, Peter Pim (26 May 2016). "Wie weet er nou het beste wat BrabantStad is? BrabantStad zelf of de minister?". Omroep Brabant (in Dutch). ^ "Taal in Nederland .:. Brabants". phileon.nl. ^ "Glow Eindhoven". Glow Eindhoven. Retrieved 2009-12-02. ^ "STRP Festival". Strp.nl. Retrieved 2009-05-05. ^ "Graphic Design Museum Breda is niet meer". BredaVandaag.nl. 2011-11-28. Retrieved 2012-02-14. ^ "FORUM, Instituut voor Multiculturele Vraagstukken" (PDF). forum.nl. Archived from the original (PDF) on 2015-01-08. Retrieved 2014-03-23. Wikimedia Commons has media related to North Brabant. Wikivoyage has a travel guide for North Brabant. Wikisource has the text of a 1911 Encyclopædia Britannica article about North Brabant.